If so, you may be suffering from the most common food allergy known to man… cow’s milk. Although goat milk, like cow’s milk and human milk, contains lactose, many people with lactose intolerance can drink goat milk. Why? It has been hypothesized that the reason lies in goat milk’s superior digestibility. Goat milk is more completely and easily absorbed than cow’s milk, leaving less undigested residue behind in the colon to quite literally ferment and cause the uncomfortable symptoms of lactose intolerance (source). Basically, if cow’s milk has you clenching your gut in pain, I think that you should try goat’s milk. 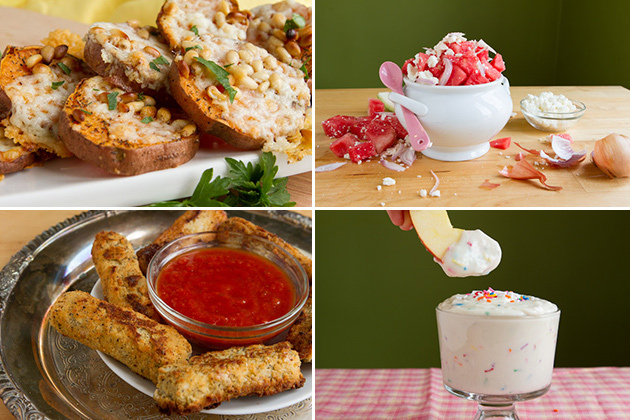 And I have 4 yummy new recipes that will (hopefully!) persuade you. 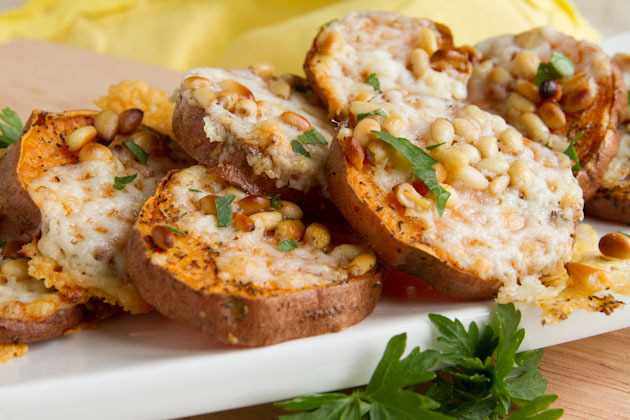 You’ll have a hard time sharing this plate of sweet potato coins with melted feta and toasted pine nuts with anyone. They’re sprinkled with thyme and parsley for a delicious, herb-infused treat. Seriously, these guys are out of this world! Dairy-free alternative: replace the feta with an equal amount of vegan cheese. 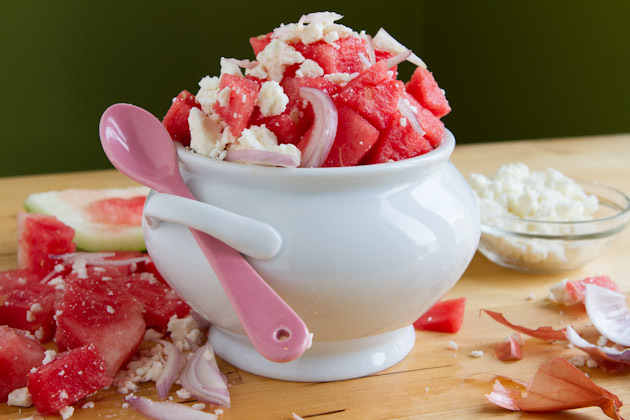 This salad is fresh, light and cooling. Pair with some cooked chickpeas or strips of chicken and you have yourself a nice, light meal! Dairy-free alternative: this salad would be great with little chunks of smoked tofu. 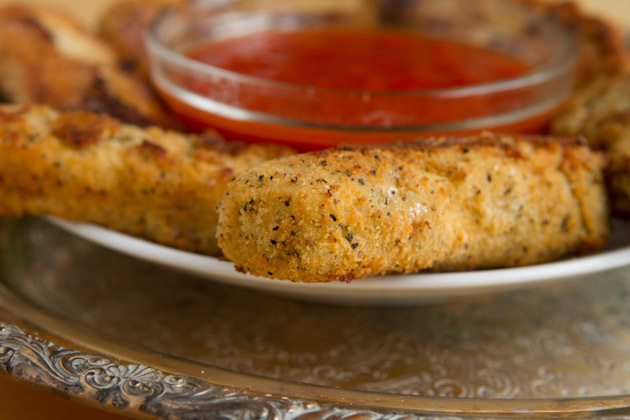 Gluten-free goat milk mozzarella cheese sticks best served hot, right out of the pan. So these guys aren’t the healthiest… but when you’re craving a little mozzarella stick action, they’re far healthier than the sticks from your local pub. Dairy-free alternative: replace the cheese with jicima or potatoes. Yes, it’s not cheese… but it’s still delicious! 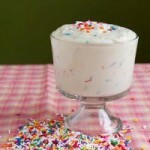 All of the ingredients of white cake made into an irresistible fruit dip, sprinkles included. 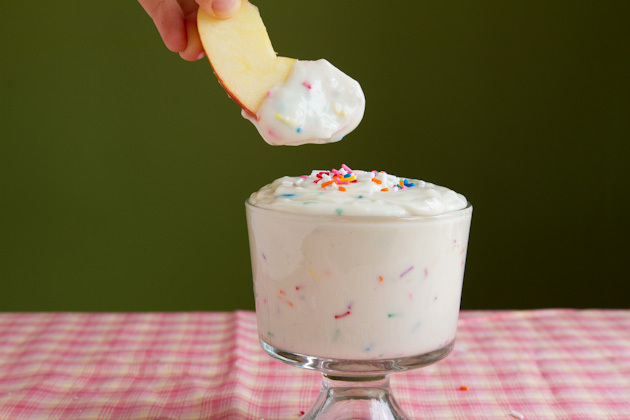 When you want cake and don’t want to a) make one or, b) wait for everything to bake, and cool… make this dip instead. Dairy-free alternative: replace the cream cheese with my vegan cream cheese recipe, and the yogurt with a non-dairy yogurt of your choice. If you follow me on Facebook and Twitter, you may have seen my CRAZY update from last Tuesday. While we were in Las Vegas (and I was checking out the special suite Kevin surprised me with)… he got down on one knee and proposed! I’ve been dreaming of marrying this man since before I knew him. He is everything I could have dreamed of, and then some. He is my everything, my love, my best friend. This post was sponsored by Happy Days Dairies. All opinions expressed herein are those of Healthful Pursuit Inc. and are not indicative of the positions or opinions of Happy Days Dairies. Thank you for supporting the brands that I believe in and choose to feature here.